Our client wished for a graphic intervention that would highlight their presence in the neighbourhood. For this, they were looking for a creative solution, which would integrate well into the historical façade and fulfil the many requirements of a listed building. After evaluating the facade, we chose a niche which in former times was used to place a statue. This niche now carries the initials of the school's name: “MELO”. We created an aluminium folded back-lit custom-made sign, and played with the height and the depth to increase the visibility of their name towards the main street. Due to the centred folding, the sign has a 3D effect, playing with the perception of the viewer and unfolding the letters as they pass by. Both during the day and in the night, the material changes colour depending on the viewing angle, enhancing the optical illusion. 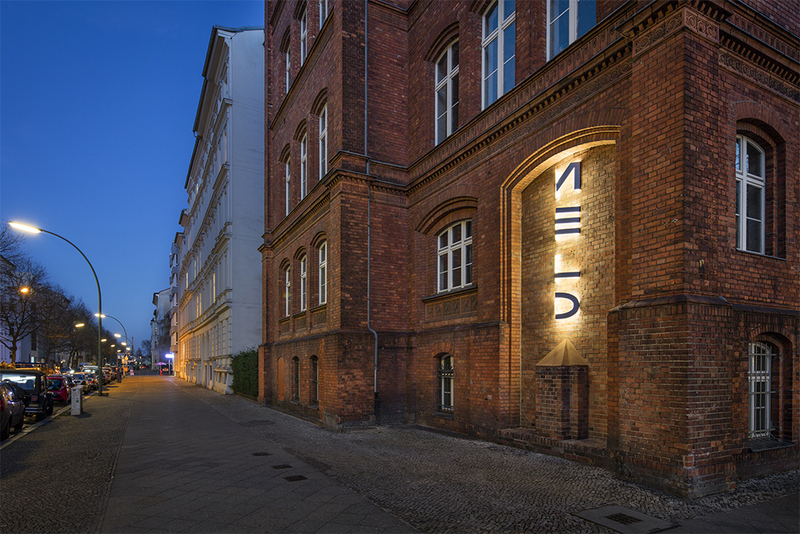 The sign complies with german listed building norms by reducing the the surfaces in contact with the facade to an absolute minimum, while still remaining functional and eye-catching. 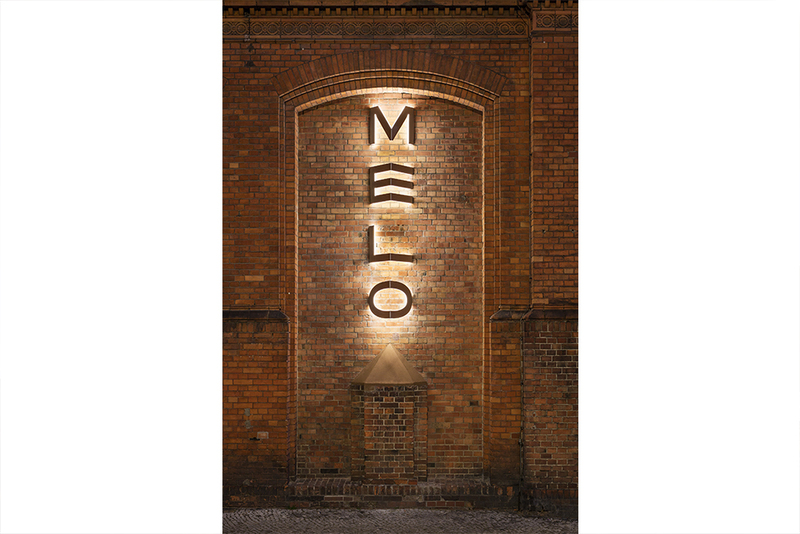 The back-lit letters lend a warm glow to the reddish historical brick facade. The lighting is linked to a sensor and a dimmer that switches on at dusk and automatically switches off at night - in order not to disturb the neighbours and to reduce light pollution. Heritage Lighting for its subtile and creative intervention. Our project have received the 3rd place in the category Best exterior scheme - low budget of the Darc Awards 2017. Unser Kunde wünschte eine kreative Lösung, die deren Anwesenheit in der Umgebung kennlich machen sollten. Der Entwurf sollte sich sowohl gut in die Fassade integrieren lassen, als auch die Richtlinien für denkmalgeschützte Gebäude erfüllen. Als Ort für die Installation wurde die Nische gewählt. Dort befand vor langer Zeit ein Standbild, jetzt trägt sie das Kürzel des Schulnamens: MELO. Wir entwarfen aluminiumgefalzte Buchstaben, die mit der Tiefe der Fassadennische spielen. Der 3D-Effekt der Buchstaben schafft eine optische Illusion, wodurch der Name sich beim Vorbeigehen entfaltet. Auch die Materialoptik ändert sich abhängig von Lichteinfall und Blickrichtung, was den optischen Effekt verstärkt. Die Beleuchtung ist dimmbar und wird über einen Lichtsensor geschaltet. Für die Sonderanfertigung wurden LED-Bänder für den Außeneinsatz in klarem Verguss verwendet. Vandalismus, Graf ti- und Taubenschutz wurde bei der Planung berücksichtigt.